The Union has five(5) standing committees. Publication and Editorial Committee: The committee is in charge of editorial duties which include all matters relating to the publication and editing of periodicals - at the national level.The committee's tenure of office ends with the current NEC, that is, 2018. Website committee:The committee is related to the managing and updating of information on the National website. Committee on Social and Moral Education (SMEC): The SMEC in consultation with NEC is in charge of revising the manual of work for the NUPS-G and in conjunction with the website and editorial commitee come out periodically with bulletins that will inform members on social and moral issues. They are usually given a slot during CB gathering such as LTS and conference to educate members on drug addiction, abuse, homosexuality, relationships and such issues. 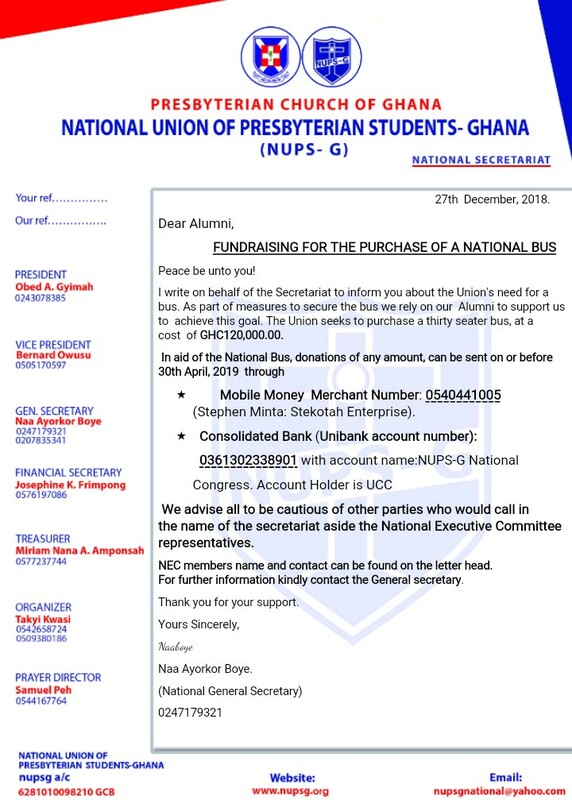 Fundraising Committee: This committee is in charge of raising funds to find the activities of the National Secretariat. They also engage in projects proposed by the National Council. The Union is primarily made up of Presbyterian Students in Senior High and Tertiary Institutions.